My research is mapping the growth of the emergency food assistance sector throughout Wales whereby I am exploring the experience and understanding of food poverty through food bank use. The research has focused on three different case study areas of Wales explaining the experience of food poverty in both rural and urban settings. Qualitative data analysis has involved the use of a multi-method approach with the various groups involved in food banks (service users, coordinators, volunteers and local referral organisations) through semi structured interviews, biographical narrative interviews and focus groups. This has been combined with a quantitative analysis of growing numbers of referrals to food banks in Wales and used to explain the growth of the sector and how this can be mapped using Geographical Information Systems (GIS). 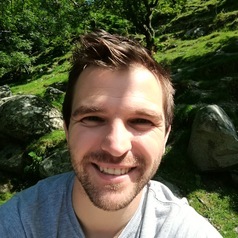 I am a Teaching Assistant in the School of Social Sciences Bangor University and a lecturer in Sociology and Social Policy at Trinity Foundation College Bangor. I am also the lead on the Love Bangor Community Partnership for Bangor University Students’ Union and a volunteer at my local food bank. I have been researching the food systems of Wales for nearly ten years both within the school of Geography (SENRGy) and the School of Social Sciences and have been able to develop an understanding of how our current food structure affects choice and justice for marginalised people both through geography and demographic indicators. My recent research work has been utilised by both the Welsh Government and the UK Government with evidence submitted to the recent All-Party Parliamentary Group on Hunger and Food Poverty in Britain and the Fabian Commission. Supervision for my doctorate is provided by Dr Hefin Gwilym (Social Sciences) and Dr Eifiona Thomas Lane (Geography).